A customer asked if it is possible to allow AD users to manage an existing virtual machine through an HTML connection. In this short video I am showing this setup with two VMs (each in their own pool) that can be accessed by two individual users that are members of an AD Group. To accomplish this you would have to create a Manual Floating pool with 1 VM per pool that can be accessed by multiple users (not simultaneously). 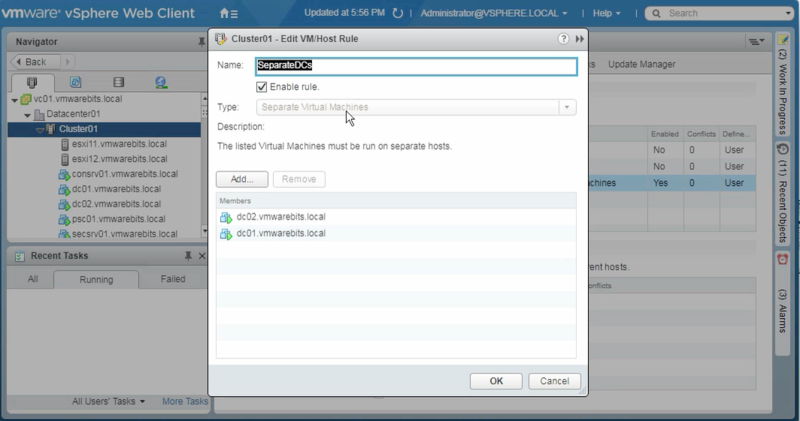 Use a manual pool to make sure VMs are not deleted or otherwise managed by Horizon. Original location: Why aren't I seeing DRS load-balancing recommendations? Read more about Why aren't I seeing DRS load-balancing recommendations? Original location: How do you reconfigure access to a VMkernel port? Read more about How do you reconfigure access to a VMkernel port? Original location: How do you enable centralized vCenter logging? Read more about How do you enable centralized vCenter logging? Original location: How do you prevent host isolation during network maintenance? Read more about How do you prevent host isolation during network maintenance? vRealize Orchestrator allows you to configure permissions for users in your authentication domain to access your vRO deployment with different types of access. While you might want administrators to access your workflows from the vSphere Web Client sometimes there will still be users that need access with the vRO client. One example is a group of developers that you only want to allow access to one or just a few folders in your vRO environment. Read more about How do you recreate a missing VMDK descriptor file?